A lot of people have a hard time understanding how to use Tiles as a procedural map for bricks, getting them to course properly and fit the model. 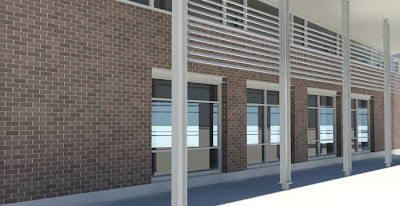 Firstly, model your building to course! If you know you’re using modular brick be sure your windows and masonry units course at 4” increments. If you’re using king-size brick be sure your model courses at 3”. The following is my attempt to explain how to create accurate bricks to scale, that work every time. I use box so that no matter what direction the object is or what plane the map is, it will always be the same scale. I also use Real-World Map Size for all of my scenes. 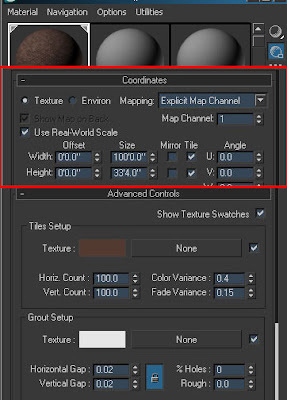 There are exceptions to using Real-World Map Size, such as certain objects with displacement, grass, water, things that don’t constitute as a building. The Real-World Map Size will ensure that all of my tiles will be accurate to size, whether they’re bricks, acoustic ceiling panels, floor tiles etc. Be sure Use Real-World Scale is checked. This will change your Size units to a physical scale (inches, feet, mm, or meters…depends on your Max unit settings). For this example, I created modular brick at 4”x12” (HxW). Under Pattern Setup, I use regular Running Bond…straight forward. Under Advanced Controls here is where it gets confusing. Adjust both Tiles Horiz. and Vert. to 100. Here’s why: the higher the number under the Horiz. and Vert. Count, the more random your color pattern will be when you increase the Color Variance. By default Max has it set at 4. This only allows a Color Variance among a 4x4 grid, hence the repeated patterning that a lot of people see. Not very helpful for brick. Making it 100x100, allows a greater range of Color Variance. This is as high as it can go, and gives you the best optimized variance! Changing your Horiz. and Vert. Count affects your Width and Height values under Size. With 100x100 under my tiles count, now my 12” width is really 0.12”. To change the width back to actual, real size 12”, multiply the original width by the Horiz. Count, in this case 100. This applies to the height of course too. Now because we changed the Horiz. and Vert. Count, we also have to lower the Grout Horizontal and Vertical Gap. A good rule of thumb is to use 0.02. Note: making these changes to your shader will make it look pixelated in your open gl scene, but when you render they will look fine. Great read, thx for the help! sir ramy I have a simple Question,, what if I want to have a color white wall texture (Just plain white color under A&d materials) Like the "Class Room" that you have made from your slide show,... do I need to import some texture from the diffuse box and use BITmap?....or just stay in my diffuse color?..... to make my question clear, what should i do if I just want a color white to be use in my WALL...?..thank you for the Help.. Simply just leave your diffuse color white...no texture maps needed. 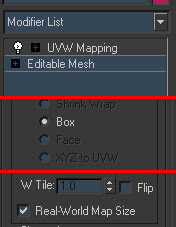 Select an object, go to the modifier tab (in the control panel on the right side), scroll down and choose UVW Mapping.